The only thing better than warm, fresh, delicious beignets, kolaches, and donuts are warm, fresh, delicious beignets, kolaches, and donuts delivered to your in home brunch, fundraiser, or corporate party. Shipley’s Do-Nuts, at 12403 Westheimer Rd., is serving up hot, pillowy soft confections 24-7 and is the best donut delivery in Houston. From the deliciously sweet donuts and beignets to the scrumptiously savory sausage and cheese variations of kolaches, Shipley’s delivers on big flavor and amazing convenience. There is only one way to eat a Shipley’s beignet and that is hot and freshly made to order. New Orleans style beignets are made to order so that they are out of this world delicious. Shipley’s customers rave that they are the best beignets in all of Houston. Once you place your order, these beauties are dropped in the fryer, pulled out shinning and glistening. While they are still pipping hot, we douse them in a hefty coat of powdered sugar before they are handed over to you to enjoy. The slightly crispy exterior paired with the airy inside of the beignet is done just right. Even New Orleans natives stop by to tell us how much they love our hot and delicious beignets. The most classic pairing for an amazing Shipley’s donut is a steaming cup of coffee. To compliment the menu of kolaches, beignets, and donuts, we offer freshly brewed coffee. For a more adventurous cup of joe, we can whip up a cup of coffee made with real espresso. From Cafe Au Lait to cappuccinos, Shipley’s has the perfect cup to compliment your treat. Your kids birthday parties- At most birthday parties, everyone gets a slice of store bought cake that has been sitting in the refrigerator all day. Imagine replacing the average cake with a pyramid of warm, soft, delicious donuts from the best donut delivery in Houston. Your guests will be delightfully surprised with the change and pleased that they don’t have to fiddle around with cutting a cake. Wedding- I know, a wedding means that there has to be a wedding cake. While a wedding cake may be irreplaceable, a few displays of confectioner sugar powdered beignets is not only beautiful like a puff of snow but they are a delicious pre cake cutting dessert and a great alternative to the non cake lovers amongst your guests. Everyone doesn’t like cake but who doesn’t love beignets? Corporate event- Office parties have the potential to be a little drab. Liven things up with the best donut delivery in Houston. Instead of the typical fruit platter or those dry cookies that seem to sneak into every office party, order some delicious donuts to enjoy. Fundraisers- Whether your next fundraiser event is for your child’s school or your corporate office, have a donut delivery set up for your Houston event to deliver the best confections for the best fundraising results. 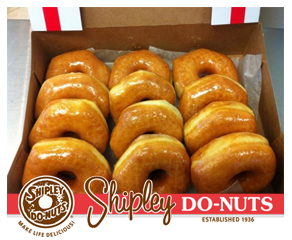 Shipley’s Do-Nut’s will completely change how you plan your next event or party. With the best, most delicious, and softest donuts, authentic beignets, and various kolaches, Shipley’s donut delivery in Houston will make your next get together the best one yet! Give us a call at (713) 589-3292 for our Westheimer location or at (713) 651-3033 for our McKinney St location! ← Reasons Donut Catering is the Best Choice!